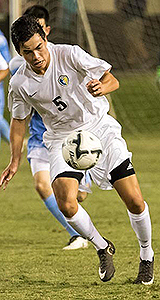 Although the Punahou boys soccer team once again had no shortage of talent this season, senior forward Duncan McKenna stood out above the rest of his Buffanblu teammates — and the state for that matter — with his play on the pitch. 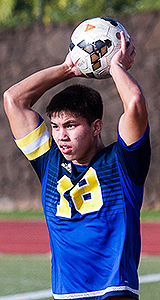 The 6-foot McKenna scored a team-high 15 goals, including four in the state tournament to help Punahou win four games in a span of a week to claim its second straight state championship and 20th overall. "I think the thing that stands out the most is that Punahou is clearly a team that offensively changed this year," Kalani coach Michael Ching said. "In the past they were more about possession and would try to pass it around more, but this year everything went through McKenna. He's physical enough to post up and serve long balls to, he can flick it with his head off to the two wingers on the outside, in space he's big and fast enough to get goals on breakaways or just beat somebody and put balls in the back of the net. Without him I don't know how the offense would look." 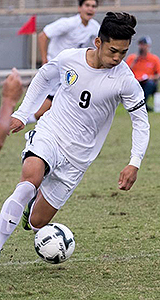 Of the Buffanblu's 13 games in Interscholastic League of Honolulu play, McKenna scored in eight of them, including five goals in two games against Damien. 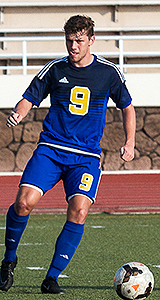 He scored in four consecutive games in mid-December to help Punahou open league play at 5-0. "He offered something that nobody else had in that he was a strong target player," Kapolei co-head coach Ryan Lau said. "He could play up top and be able to play any type of game, whether it be free-flowing or when the game gets tight and tough, like at the state championship level. He can play with bodies around him and be strong and get good positioning in the box and with the guys around him that can serve the ball, he's just really good in the final third and up top." McKenna, who was selected as the ILH's offensive player of the year, scored twice in a state quarterfinal win over Kealakehe. 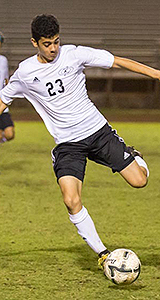 He netted the lone goal in a 1-0 double-overtime semifinal victory over Kapolei before capping his career with another goal in a 2-1 win over Kaiser in the championship match. "It didn't seem like he never got tired and at full strength the guy was just unbelievable in his work ethic," Ching said. "He was challenging for every play, he played defense and he played offense. I really respect how hard he worked on both offense and defense." McKenna was also selected as the most outstanding player of the state tournament. As the adage goes, defense wins championships and Peyton Sommer was a key cog in the backline of Punahou's state title-winning squad this season. 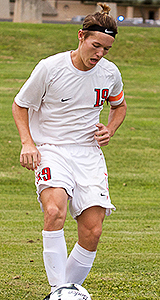 The 5-foot-10 senior fullback helped the Buffanblu allow just 10 goals on the season. They posted nine shut outs, including seven during the Interscholastic League of Honolulu season. 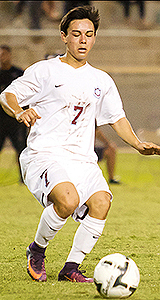 Sommer typically played the outside left-back position, but often switched over to the opposite side to matchup against an opposing team's top offensive threat. "He was study and could provide service and leadership from the back, but if they had a difficult matchup on the other side it seemed like Punahou was comfortable switching him to the other side," Kapolei co-head coach Ryan Lau said. "Against Kalani they switched him over and made the adjustment. He gave them flexibility on the field and a good student off the field. 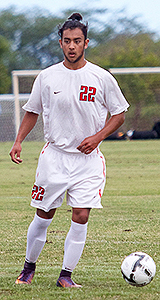 He's been a critical player on the back line the last couple of years for them." 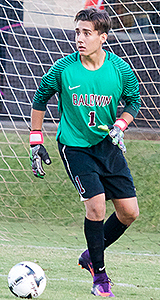 The Buffanblu outscored their opponents a combined 47 to 10 on the year. 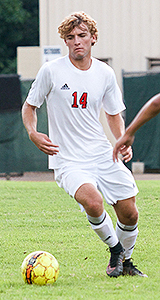 Although most of his work was done on the defensive end, Sommer did score a timely goal in a 2-2 tie against Iolani on Jan. 18. His contributions to the offense hardly stopped there, however. "Punahou likes to play it to their outside-backs on the quick ball and I thought he had the most composure back there," Kalani coach Michael Ching said. "He makes good passes and he's just very, very solid. I bet if he played center-back he'd be rock solid, too." Ching added that Sommer — with the ball in his hands — proved to be quite the dangerous weapon. "The thing that is underrated with him is his long throw because he doesn't take a step. He just kind of sits there and can go short or long and you have to play (defensively) where he can go short or wind back without taking a run up and be able to throw it to Duncan's head for a goal on a one-on-one," Ching said. 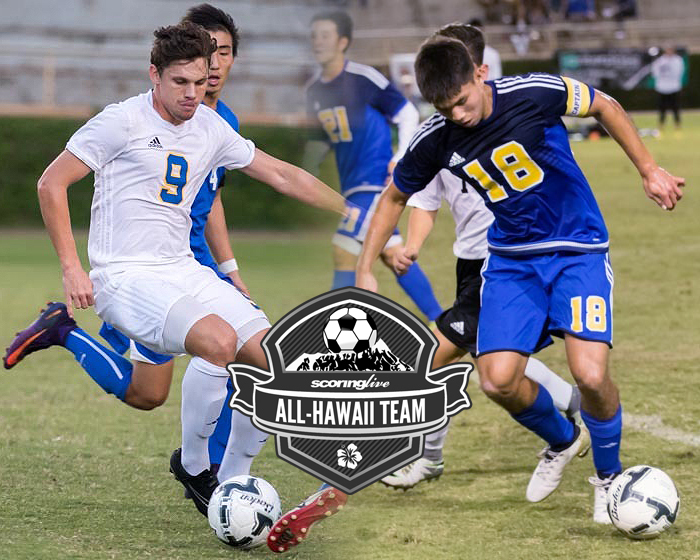 Sommer was named a first team ILH all-star, along with three other Punahou defenders — Kai Terada-Herzer, Kyle King and Christopher Espinoza — and goalkeeper Ian Withy-Berry. The Division I state championship match was a David-versus-Goliath type of matchup. 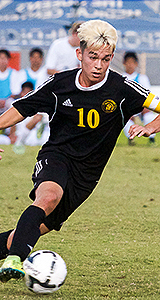 In one corner, Punahou: the premier boys soccer program in the state. In the other, Kaiser: which was seeking its first state crown. Unlike the biblical story, however, Goliath won this battle in the form of a 2-1 victory for the Buffanblu — their record 20th state championship in program history. But the Cougars and their first-year coach, Layne Abalos, left quite the impression after a 14-2-1 season and a memorable run to the state final. "I think he did a tremendous job in changing the culture of the team," Kapolei co-coach Ryan Lau said. "Kaiser has always had talented players, but they didn't necessarily always play together. I think what he did was lay down a little bit more rigid expectations of how the players should carry themselves as student-athletes and playing more as a team." Kaiser went 9-0-1 during the regular season to finish atop the Eastern Division standings. 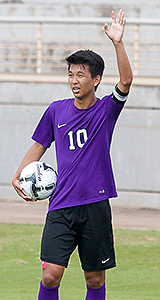 It suffered its first loss (1-0 to Kapolei) in the semifinals of the Oahu Interscholastic Association tournament, but went on to win four straight contests to reach the state title match. Along the way, the Cougars knocked out Interscholastic League of Honolulu champion and tournament No. 2 seed Iolani with a 2-1 victory in the quarterfinals and Baldwin, the Maui Interscholastic League titlist and third seed, in a 1-0 semifinal win. "I don't know how he could have done a better job besides winning it all obviously," Kalani coach Michael Ching said. "Being a first-year coach anywhere, it generally takes a while to get your system in place. Layne wasn't an assistant; he came in and had to learn everything for the first time, from OIAs and states and bus schedules. All that stuff is not necessarily hard, but it adds up." Ching also noted that Kaiser did not have the luxury of practicing or playing on its home field this season due to ongoing resurfacing work on the field. "That's what is most impressive to me because it's pretty hard to practice without lines," Ching said. "If you want to run some corner kicks, well, where's the box? How do you practice that? Free kicks? Same thing. I think that alone is so impressive, but the other thing is he surrounded himself with the right mix of people and the players bought in. It was his vision, his playing style and he brought in the people to help execute it. He wanted to change the culture and I think he did it his way."